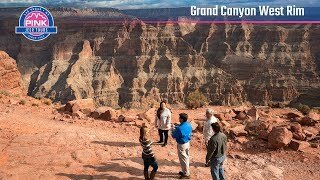 Las Vegas to Grand Canyon Tours - Book Online Today! A trip to the Grand Canyon is simply incomparable, and our Grand Canyon West Rim Classic Tour ensures you will enjoy an authentic experience at this natural wonder. Plus, plenty of Southwest sights on the journey there and back. Our knowledgeable Certified Interpretive Tour Guides and custom Tour Trekker will make this one journey you’ll never forget. To start, we’ll pick you up at your hotel and give you a comfortable ride with unobstructed views during the drive to Eagle Point. Along the way, you’ll see Lake Mead; as the largest man-made reservoir in the country, it contains enough water to flood the entire state of New York. You’ll also travel through a Joshua Tree forest that is unique to the Mojave Desert. Eagle Point is home to the Hualapai Village, a native Arizona tribe whose ancestors date back to A.D. 600. Upon your arrival, you will be treated with a barbecue lunch with vegetarian options. Eagle Point is also home to the Grand Canyon Skywalk, a glass and steel structure that extends 70 feet out over the rim and gives you views of the canyon floor over 4,000 feet below. It’s an experience that will make you feel like you’re walking on air. Skywalk admission is an additional $25 and can be purchased at the canyon. Guano Point is another highlight of this tour. Walk out to the edge of the point for nearly 360-degree views. The natural bat cave located here was the location of a climactic scene in the film “Edge of Eternity” (Columbia Pictures, 1959). See if you can spot parts of the historic tram that stretched across the canyon to a guano mine. After your time at the canyon, you’ll head back to Las Vegas. A quick stop for a photo op at the iconic Hoover Dam will showcase this concrete architectural wonder that holds back the waters of Lake Mead. The Hoover Dam is a National Historic Landmark. There’s much to see and do during our Grand Canyon West Rim Classic Tour, but we’ll make sure you catch all the best sights. A combination of history and stunning beauty makes this journey unforgettable. Our tour guide was fantastic. He made us very comfortable, got everyone talking to each other. He was friendly, funning and kept it very interesting. We saw beautiful sites and were engaged the entire 9 hours. At the hotel no clear signage was visible to instruct us to the right location, we were wondering if we were in the right place for pickup. Fantastic, fun filled day. Great information given by Carol all day. Very attentive to all her guests. Glenn was an awesome tour guide. He was very knowledgeable about everything we were doing. He gave us history and also spent the time talking to each and everyone of us on the tour. He explained things took pictures for us waited until we were all ready. Ne never rushed us. Unlike other tours they have schedules to keep . I enjoyed looking at his photos of the scenery that he took. I would recommend for any of my friends to ask for him as a tour guide. Katherine was an excellent, informative, friendly and inclusive tour guide. (She introduced us all to each other and as a group we got on well thanks to her introductions). Katherine listened to what we were interested in and went out of her way to help us achieve it, eg. stopping at the Joshua trees. Her knowledge of the Hoover Dam and Grand Canyon was invaluable. I would happily recommend this tour to anyone without any hesitation. Jessi H . Was an awesome tour guide, made us laugh, have a good time, best tour I had in a long time anywhere! Thanks again Jessi you was awesome! Polite, courteous, 5 stars all the way around! !